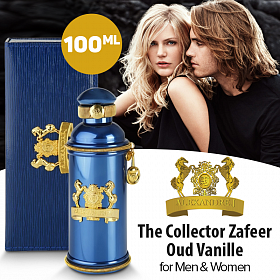 The Collector Zafeer Oud Vanille by Alexandre J for Unisex spells a sweetness with spicy hints. This Eau de Parfum is packed in a 100ml bottle.Enjoy the charismatic aroma and fresh feel by using the The Collector Zafeer Oud Vanille by Alexandre J for Unisex. This perfume makes you feel pampered and is truly vivacious. 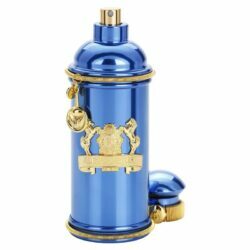 The perfume smells spectacular and is filled into a classy, gold colored bottle with a 100ml capacity. The bottle tries to capture the attractive feminine traits with its curvy edges featuring a magnetic closure. The fragrance opens with notes of coconut, leather, and toffee that offers freshness with a hint of sweetness in the air. The core of this Eau de Parfum spells its magic with the cloves, tonka bean, white woods and ylang-ylang that not only exudes a floral aroma but also lightens up your mood with just a single spray. Finally, this Eau de Parfum closes with notes of musk, agarwood, and vanilla.